Tiffany Blue Book Dragonfly diamond and sapphire cocktail watch, 2017. Those familiar with Tiffany & Co. know that the brand annually unveils its Blue Book– one-of-a-kind and unique pieces of jewelry and watches bedecked in gemstones and sporting a key theme. This year, the brand continues in its “The Art of the Wild” with a motif focusing on insects, birds, trees and flowers. There are 16 stunning watches joining the line up. Tiffany & Co. Bluebook 2017 cocktail watches with nature theme. 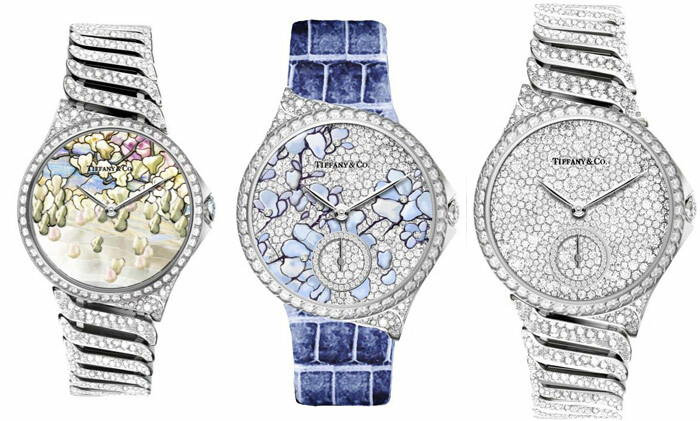 Oval-shaped unique cocktail watches with marquetry butterflies in alluring hues of pink, as well as a diamond-and-sapphire set version. Tiffany & Co. Blue Book 2017 cocktail watches with butterfly theme. Round watches in 34 mm white gold with either gem-set dial, case, bezel, crown and, in several instances, bracelet. There are also dials that boast floral motifs via a marquetry mix of semi-precious stones (such as opal and chalcedony), diamonds and enamel. These watches are powered by self-winding mechanical movements. There are also 28mm round watches meticulously set with diamonds and boasting a quartz movement.